A horde of upper class, entitled, ne’er do well twenty somethings look to break into the home of Ethan Hawke and Lena Heady in the The Purge. The film attempts to unravel its twists and turns slowly, but things turn to predictable and familiar faster than the story moves, with underwhelming action sequences and any horror and tension getting lost in this uninspiring home invasion tale. What if on one night every year you could commit any crime without facing consequences, what would you do? In The Purge, four people are tested to see how far they will go to protect themselves when the vicious outside world breaks into their home. 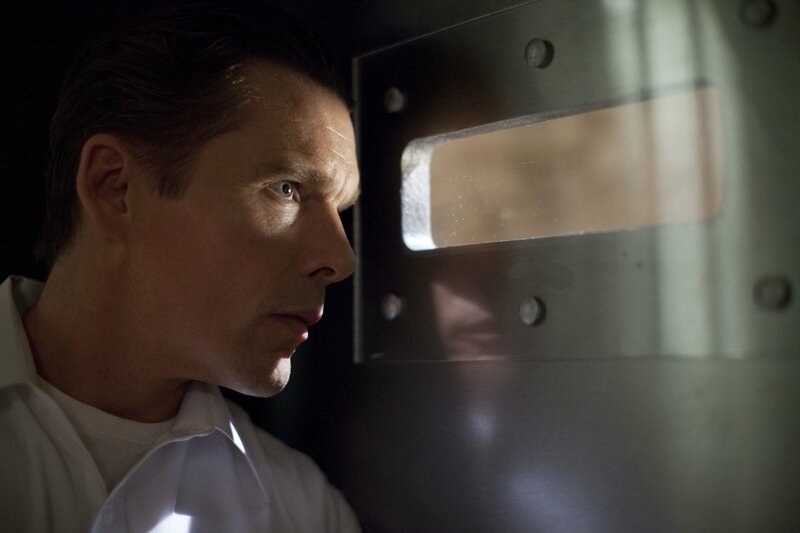 When an intruder breaks into James Sandin’s (Ethan Hawke) gated community during the yearly lockdown, he begins a sequence of events that threaten to tear a family apart. Now, it is up to James, his wife, Mary (Lena Headey), and their kids to make it through the night without turning into the monsters they’re hiding from. While the premise of the film could lead to many debates and arguments over the morality and decency of even allowing an evening like this to exist (let alone having the event government sanctioned), the film barely scratches the surface when it comes to any personal reflection on the morally questionable quandary the purge itself would pose. Instead they give us a homeless victim sheltered by the family (complete with perfectly camera framed dog tags to build sympathy), which causes the walking gang of clichés outside to wreak havoc on the house. The group, wearing masks that are a cross between the ones in You’re Next and The Strangers, is made up mainly of college students. They’re led by a terribly bland and rather annoying character referred to simply as ‘polite stranger’. The stranger’s final comeuppance is drastically nonchalant, only adding to the meaninglessness of the character. The rest of the performances are passable at best with Hawke being the most reliable. His turn in last year’s surprise Sinister was also solid, but The Purge cannot match that film with its storytelling. The rest of the family is mediocre to terrible, with all the faith built up in Headly’s character being lost with a ridiculous begging sequence that goes on far too long and actually feels like director James DeMonaco is stretching for time. Max Burkholder’s Charlie is likely to entice audience members to chant for his head with his character’s actions and his acting choices, while Adelaide Kane fares only mildly better as she completely disappears for chunks of the film, even while locked inside the house. The film does manage to craft one excellent sequence staged in the games room amongst the pool table and such that features some excellent stunt work and good choreography. But the film overall manages to be spectacularly underwhelming and bloated even. You know when a film that barely runs 80 minutes feels far too long that opportunities were missed all over the place. While the premise of the film could lead to many debates and arguments over the morality and decency of even allowing an evening like this to exist (let alone having the event government sanctioned), the film barley scratches the surface when it comes to any personal reflection on the morally questionable quandary the purge itself would pose. Instead they give us a homeless victim sheltered by the family (complete with perfectly camera framed dog tags to build sympathy), which causes the walking gang of clichés outside to wreak havoc on the house. The group, wearing masks that are a cross between the ones in You’re Next and The Strangers, is made up mainly of college students. They’re led by a terribly bland and rather annoying character referred to simply as ‘polite stranger’. The stranger’s final comeuppance is drastically nonchalant, only adding to the meaninglessness of the character. The film does manage to craft one excellent sequence staged in the games room amongst the pool table and such that features some excellent stunt work and good choreography. But the film overall manages to be spectacularly underwhelming and bloated even. You know when a film that barley runs 80 minutes feels far too long that opportunities were missed all over the place. This entry was posted on June 18, 2013 by moviejunkieto. It was filed under Reviews, Theatrical and was tagged with Adelaide Kane, Ethan Hawke, Lena Headey, Max Burkholder, Purge, Strangers.